Budgeting for Broadband Network Sustainability | Strategic Networks Group, Inc. In the past, efforts to market broadband services have often been an afterthought to the network build, or left to the private sector as part of their business development. 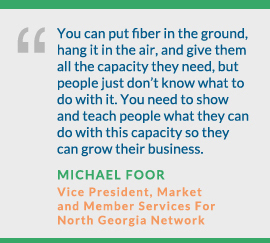 If you are building-out a network to unserved and underserved areas, where incumbent service providers have not seen enough of a business case to invest, you must have adequate resources for marketing and community engagement to raise awareness, drive demand, and maximize community impacts! Whatever digital infrastructure investment is being made – whether retail network, open access network, or smart community initiative, you must assess and drive demand and be able to tell the story about how it benefited the community. Call it Marketing, Driving Demand and Performance Measurement and build it into the capital budget for the network. This ensures you have the resources for ongoing efforts to be effective with market research and community engagement. This cannot be underestimated as network sustainability and overcoming the challenges faced by local network investments (growing market demand where there has not been enough to justify a private sector business case for broadband investment, overcoming resistance by incumbent service providers, taxpayer resistance and political risk, etc) must be addressed for success. Marketing and community engagement efforts are most important in the early stages of a digital infrastructure or transformation initiative when operating budgets are stretched thin, or not available. Include in the capital financing of the network at least 10% for marketing, community engagement, and performance reporting – this will drive digital transformation in the community, which in turn drives service sustainability, local economic growth, and community benefits. There is urgency to providing local residents and businesses the broadband they need because the cost to the community will be greater if they leave, or are not able to be competitive. Show community return on investment (ROI) in terms of business retention and growth, GDP and tax base impacts, quality of life benefits, etc. Below is an example of a high-level budget. A detailed actual budget for your community can be developed with SNG’s data-driven analytics that is comprehensive in assessing the resources needed to reach network demand and sustainability goals, thereby shortening the path to community benefits and economic impacts. Identify evolving connectivity and smart community service needs of local households and businesses and then assess which are economically feasible to implement. Convert potential demand into service uptake and utilization, which drives local benefits from digital transformation and network sustainability. Customize community engagement strategies to build local buy-in and work together in addressing local digital divide issues. Demonstrate community impacts and network ROI. Broadband market demand baseline and ongoing performance reporting provide data points on economic growth and community benefits, which manages project risk and avoids pitfalls. Enables new technologies and online practices to be implemented by those who cannot afford the full cost themselves and where the community benefits outweigh the grant amount (e.g. tele-health, connectivity for students to complete homework after school hours, smart waste management, smart parking, teleworking / co-working spaces, incubators for entrepreneurs and start-ups who need digital infrastructure). Creates new jobs and workforce opportunities for those implementing new technologies and supporting online activities (e.g. creating a website with online purchasing, creating and maintaining a social media relationship for the business or organization). Drives growth from local businesses reaching new markets, which brings new money into the community. Grows demand for higher value digital services which improves local competitiveness and network sustainability. Take a data-driven approach to assess and drive demand and be able to tell the story about how digital infrastructure and transformation benefited the community. Develop marketing strategies and tactics that identify key user and community groups. Personalize to individual businesses and households the ROI of online practices. This is an ongoing process and key to driving demand. It is also necessary for achieving network sustainability and realizing community benefits that include new jobs, local business growth, GDP and tax base increases, etc.